Beautifully engraved certificate of deposit from the Postal Savings System issued in 1941 in Flushing, New York. 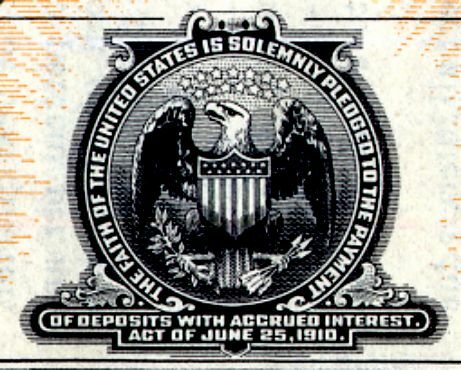 This historic document has the eagle with a branch and arrows in its claws, an American-flagged shield on its belly, stars over its head and the excerpt: "The faith of The United States is solemnly pledged to the payment of deposits with accrued interest. Act of June 25 1910." This item is has the printed signature of the Postmaster General and is over 70 years old.